Halfnelson made dozens of home recordings during the late sixties and the most famous one was Halfnelson's "A Woofer In Tweeter's Clothing" demo Lp - not to be confused with the second official Sparks' Bearsville album - released in 1969. The first official album on Bearsville Records came out in 1971 under the name "Halfnelson" but didn't have much impact on its initial release so Albert Grossman's Bearsville suggested the boys change their monicker and the record company repackaged it under the name "Sparks" with a revamped packaging one year later. 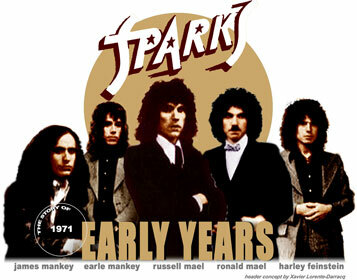 After becoming Sparks, a single, "Wonder Girl", was released from the re-issued album. The b-side of the single was an edited and speeded up version of "(No More) Mr. Nice Guys". The second Sparks' Lp "A Woofer In Tweeter's Clothing" was released in 1973. "Girl From Germany", the most normal sounding song from the Lp was released as a single with "Beaver O' Lindy" on the b-side. In 1975, after Sparks' huge success in Europe, Bearsville Records reissued Sparks' first self-tiled album and "A Woofer In Tweeter's Clothing". This double package was called "2 Originals Of Sparks" and was released in the United Kingdom for the european market. A Cd reissue of the first two Bearsville albums came out during the nineties on Essential Label. All tracks had been remasterized. Sparks & A Woofer In Tweeter's Clothing (Castle Music - UK - 1999 - ESM CD 677 - LC6448.